My journey began in April 2013. I was a stay at home mummy with two beautiful boys, and William my partner. I was healthy at thirty weeks pregnant, excitedly looking forward to the birth of our daughter who we had already named Kelsey-Mae Patricia. I started with unbearable back pain, after a while as it wasn’t getting any easier I went to hospital thinking I had gone into early labour, they admitted me for an overnight stay as my blood pressure was low, by morning I was sent home as the baby didn’t seem ready to be born. As the day progressed my tongue felt all tingly like I had burnt it on a hot cup of tea, then my hands and feet felt tingly and I became exhausted, I tried to get some sleep and rest but the back pain was so bad I had to visit my GP, it was all put down to pregnancy and I was advised to rest, which was nearly impossible. Over the next twenty four hours the pain came and went so I did manage to fall asleep, but on awaking I realised something was seriously wrong as my face had dropped on the right side, I shouted for my mum who had stayed to help William with the children. We rang 111 and an ambulance arrived and took me to A&E, then I was transferred to the medical assessment ward where I was transferred to the medical assessment ward where I was now diagnosed with Bells Palsy, they gave me steroids to take and I was discharged. I went home but I couldn’t stop being sick and my balance was affected, I managed to sleep for a while but over the next twenty four hours I became worse, I woke up to find both sides of my face had dropped and I had lost the use of my right leg and kept dropping to the floor which was very worrying being so heavily pregnant, I knew there was something very seriously wrong but no-one was listening to me. I managed to get an appointment with an out of hours GP who suspected I was having a stroke, I saw a neurologist who immediately sent for an ambulance to take me to The Royal Preston Hospital where I was seen by another consultant who diagnosed Guillain-Barre syndrome, I was then given an explanation of what can and might happen. The horror of the situation hit me, “What about my baby girl about to be born, is it going to happen to my baby, is she going to be okay?” I was admitted and things went from bad to worse, I was put on oxygen and needed a feed tube as by now I couldn’t swallow. On the second day 9th May 2013 at 5.15 am I went into labour, it was a long and stressful labour and I was now getting weaker by the hour, but my little baby girl arrived safe and healthy weighing 4lb 15oz, she was perfect but had to be taken to ICU to keep her temperature at the correct level, at this point I was transferred to the neuro ward. I was extremely exhausted and sore after a natural birth but the feeling of emptiness overwhelmed me as I was separated from my new baby. Two days later Kelsey-Mae went home to be with her brothers, nana and auntie, while I stayed in hospital. The following day 11th May my breathing was affected and I was rushed to ICU to be intubated and later remembering waking up with my partner William at my side holding my hand, I tried to move but couldn’t, I was paralysed from my eyes to my toes, I couldn’t even shut my eyes, I was strapped in my own body, there were tubes everywhere, but the first thing I could think of was my children, I need to go home to look after them. How could my life go from perfect to the deepest hell within two weeks? What did the future hold, would I ever be able to walk again, no-one could tell me. Over the next few weeks I was pretty much in my own world, hallucinations became the norm, some funny ones and others were horrific, I could see family members sitting round the bed and staring at me, I could see family members sitting round the bed and staring at me, I would try to talk but it was mostly rubbish, I could see in their eyes things weren’t good. 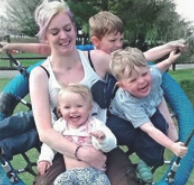 I didn’t know the date or how long I had been there as the days just rolled into one, but I did know I hadn’t seen my children for weeks and I was pining for them, I worried that my new baby Kelsey-Mae wasn’t going to know me. It was on my 24th birthday that I was taken off the oxygen and put into a coma. In due course I started to come round from the coma and mum would ready my get well cards to me, I now started to get very slight movement after a course of IVIg, I learnt how to communicate with family members using my eyes and an alphabet sheet, but I would get very frustrated if they couldn’t understand what I was trying to say. Another few weeks later and I started to improve, I felt movement coming back in my hands and fingers; I started to use the speaking valve and trained my breathing ready for the tracheotomy to be removed. I remember the first day I used a hoist; the pain was unbearable but couldn’t tell the staff, my legs felt like thousands of pins stabbing my entire body, and at this stage I couldn’t hold my head up. Eventually I was moved to the ward still with the tracheotomy in, and I could sit in the chair more comfortably, most importantly my children could visit me every day. I was now determined to beat this illness and go home to where I belonged with William and my children. I started to use a standing hoist with the physiotherapist and although the pain was still severe it was worth it as it was nearing the time to be allowed home for short periods. 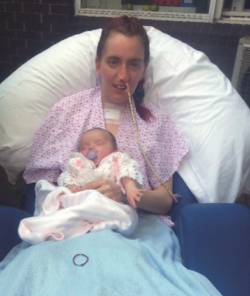 August arrived and I was allowed home for the first time, it is a day I will never forget, I realised how much I had missed being away from the children for so long, the boys had grown and Kelsey-Mae had started to smile, I felt it so unfair. By the end of August it was approved that I could go home until rehab was organised, I was still bed bound or chair bound but I was home with the children, William and my family. It was October 2013 when I was transferred to rehabilitation to begin the hardest phase of my recovery, I did start to improve more quickly from this point, and in February after four months in rehab I was out of my wheelchair and walking with a frame. March came and I had a setback with the symptoms returning, so had to return to The Royal Preston Neurological Hospital for a course of IVIg, eventually I was diagnosed with CIDP. April 2014 and going home at last walking with a stick, home to my family. I have fortnightly treatments of IVIg and steroids. Sometimes I still have neuro pain in my feet and I ache, fatigue is persistent and some days I really struggle, but my life is going well at the moment. I am grateful for the support I had and still have, William who stood by my side all the way. I couldn’t have got through it without my family. I love my princess Kelsey-Mae who is mummy’s little girl, my boys Mckauly-Dean and Kayden. I try my best now to do activities with my children and be the best mummy I can be, we have lots of fun. I am grateful for the life I have and the people in it. If it wasn’t for Guillain-Barre syndrome I wouldn’t have met some of the most amazing people, the staff at The Royal Preston Hospital, staff at Rakehead Rhabilitation unit, and the lovely people of the Lancashire and Cumbria Association of GAIN who have been a great support.